My colleague had been periodically taking photographs of the gardens at a stately home in the UK for the National Trust over the last couple of years. 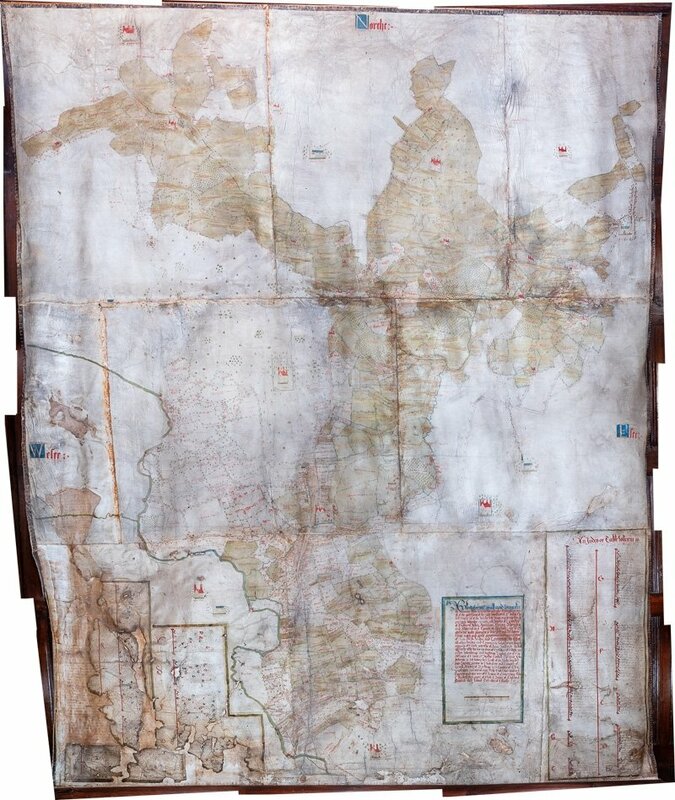 He was however somewhat taken aback when asked to photograph the 400 year old estate map drawn on vellum, that hangs in the Great Hall, not knowing if it was a practical proposition for amateurs to tackle. We were discussing it one night over a glass of wine (or two) and decided that with a joint effort it would be ‘fun’ to have a go. It wouldn’t be a paid commission so failure would not be an issue. And so it was that we presented ourself as the venue during the early part of 2018 for a trial run. I should explain at this point that a detailed image was required so that all of the minute fading ink writing could be seen showing the field boundaries, size and owner notation. The plan by the NT researchers was to overlay our image on the current OS maps to see how the boundaries had changed and if any of the properties were in the same family ownership. The map is over 6 feet wide and 8 feet deep, rippled, falling apart and could not under any circumstances be touched! Lighting was a problem. Because we were going to be stitching several images, it had to be even and consistent. In the end I bought a flat panel LED light that fixed to the camera hot shoe, which proved ideal, and our trial shoot taking and stitching 4 images was very acceptable. Like all big organisations various permissions had to be obtained and it was only this week that we were able to get cracking. Access was the big issue for the main shoot as the top of the map was at least 10 feet high, but the NT volunteered to erect a tower scaffold for us, hopefully to solve the problem. The broad plan was to use my D750 with a 35mm prime lens. The 24Mp sensor would provide enough detail in files that were not too large in comparison to my colleague’s megapixel D850. 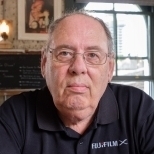 The 35mm lens would give a reasonably wide field of view, be relatively distortion free, and stopped down to f8 should overcome the ripple problem. The rig would be tripod mounted and tethered to a laptop so that the images could be transferred and viewed immediately to check focus. The tower scaffold was a nightmare. It was not wide enough to cover the whole width of the map by about 6 inches either end and the number of braces and safety rails made accurate positioning impossible. Oh and then there was the glass lantern! Again very old and precious that hung down below the top of the map and inside the tower scaffold platform. We decided in the end to hand hold using the various bars for support despite the risk of camera shake. We would only use the tripod at the lower levels when the scaffold was out of the way. So imagine if you will me squirming about on the platform, on my knees, sitting, lying down, while my colleague dutifully held the lap top and tether and checked each shot for positioning, exposure and focus. All going fine until the LED panel fell to the floor, but mercifully undamaged when recovered. To cut a long story short it all worked. We ended up with 25 images that would need stitching together, each image being about 31Mb. Enter Lightroom. Clearly each image had to have a consistent look and so I edited the first image to get maximum clarity and from this created a preset. The remaining images were quickly edited using the preset with very satisfactory results. My first thought was to stitch each horizontal strip and then combine the strips, but Lightroom informed me that this was not possible. I ended up by selecting all 25 RAW images and hit ‘panorama’ and went off for a cup of tea, came back and went off for another cup of tea …. Eventually my final image appeared on the screen, 15,633 x 18,552 pixels, and a file size in excess of 1Gb. How easy was that? You can see the results in the accompanying photographs. The seams that you can see on the finished map image are the joints in the velum not from the digital stitching, and the distortions on the edges replicate the curled edges of the original exactly. It was a great exercise with a pleasing result, and I know that both both my colleague and I learnt a lot from the need to improvise. The first image shows our set up with the scaffold removed, the second the final image and the last a small extract from the final image at 100%. Wow, what an epic project, Mike! Congratulations on the result and thanks for sharing the story with us. Super story Mike, well done indeed! Fascinating project, and congratulations on such a good result. It would be interesting to know how the overlay of the photo on the map works. I'm not sure about that either and am not privy to what the NT have in mind. It is probably being geo-referenced into a geographical information system (GIS). Basically you match known points on the photo with points on the map and then let the computer do its work twisting and stretching the photo over the map. Mathematically, it is similar to the distortion corrections available in our photo editors. The challenge for a project like this is deciding which corrections to apply and if, after all the corrections, the result is valid. I'm guessing that getting boundaries within 2-3 metres would be a success for this given that the old map was photographed hanging from the wall. The project is probably more about "field 1 & field 2 were combined and field 4 was sub-divided". Why & when did this happen? Another interesting challenge would be to go back and photograph it in infrared or ultra violet, but finding appropriate light sources may be difficult. 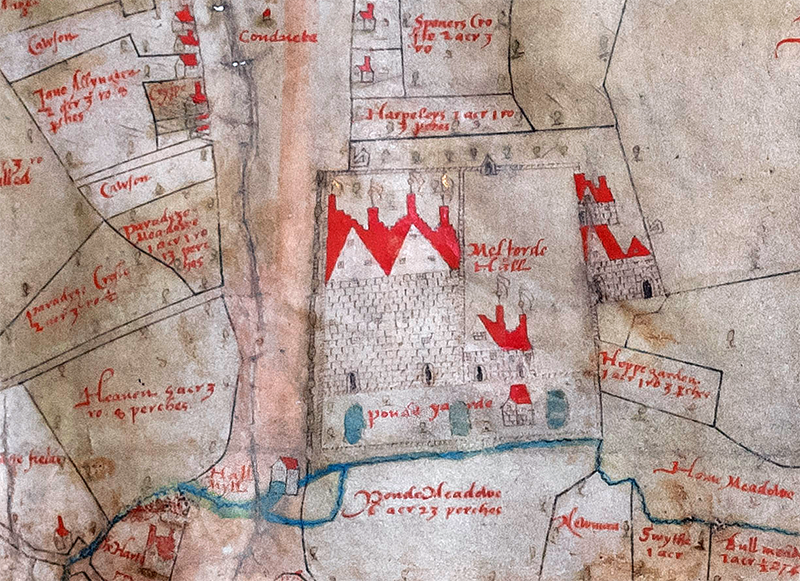 The whole process is a bit hit and miss given that the map was hand drawn in 1580 and there is undoubtedly more than a little artistic licence in play. I suspect that more information will be gathered from side by side inspection and interpretation of geographical features. 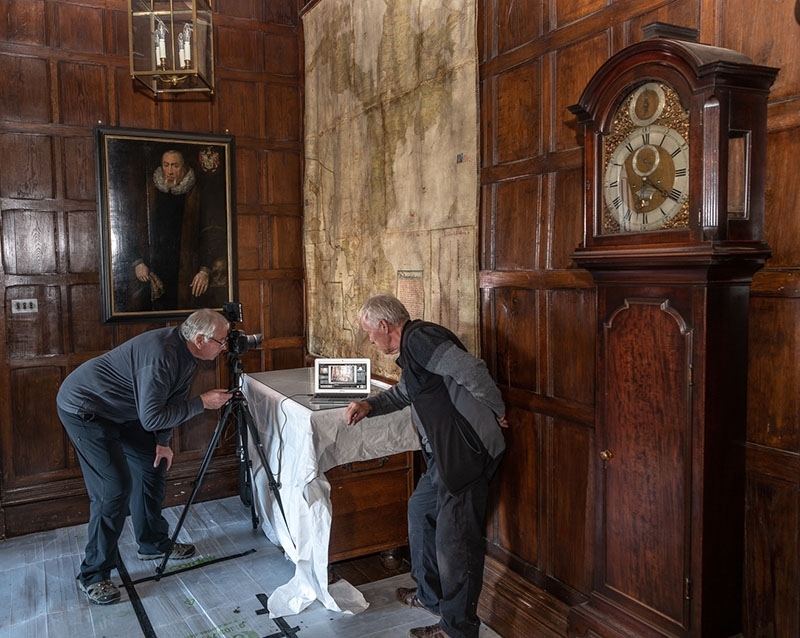 We have to bear in mind that most of the detail within the original has not been inspected by the current staff given the severe restrictions on accessing the map (both physical and regulatory) so they are already learning so much from being able to inspect it in minute detail. It will nevertheless be interesting to see if they use more sophisticated techniques. As tempting as it might be, I'm not sure I want to go back and repeat the excise with different light sources. It took six months to get permission this time around!